From the next release on, Krita will officially support OSX. That means that the OpenGL canvas works fully and that we’re committed to fixing OSX-specific bugs, just like we’re fixing bugs on Windows and Linux. It means we’re confident that you can use Krita 3.1 on OSX and be productive, instead of experimenting. So, please test this beta, and help us find bugs and issues! Of course, Krita 3.1 will have much more new stuff. 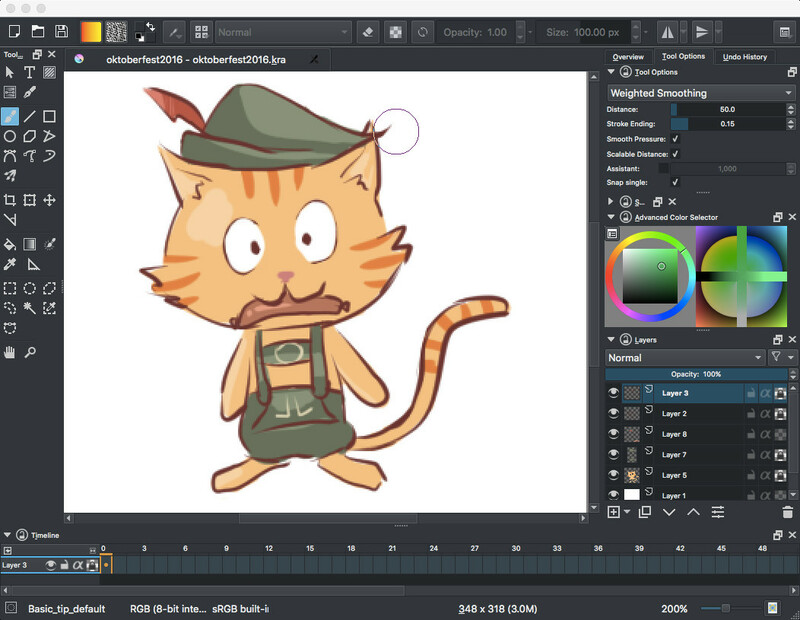 A new brush engine that supports really big brushes, Jouni’s Google Summer of Code work on adding new features to animation, Wolthera’s Google Summer of Code work that adds color managed high-channel depth color selectors and soft proofing to Krita, a stop-based gradient editor, ffmpeg-based export to animated gif and video formats. And much more. The second beta is also much more stable and usable than the first beta (3.0.1.90), and we’d like to ask everyone to try to use this version in production and help us find bugs and issues! There is also a snap image available in the Ubuntu App Store, in the beta channel.